On the cusp of 2020, a date many have actually targeted for more than 20 years as a benchmark of Madison’s growth as a region, our business sector is ready for its close-up. As we report in some detail in our cover story this month, the Madison business community has not just changed, grown and matured, it is poised to compete with that of any city in the country. 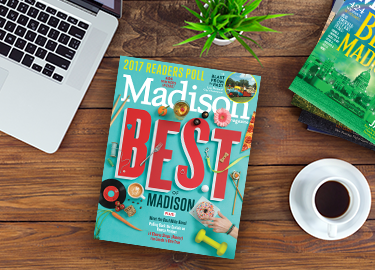 Making the case for that position persuasively and comprehensively are this year’s Best of Madison Business honorees. Our winners are the best examples of who we are and what we do. They include nationally known startup accelerators, cutting-edge bioscience companies, 21st century globally competitive financial services and strategically inclusive innovation advocates. Having already dipped his toe into the entrepreneurial waters by creating the Sconnie Nation brand of T-shirts and beer among other iconic Wisconsin products, Troy Vosseller partnered with Joe Kirgues to found gener8tor, an innovation startup accelerator. It vets interested, high-growth startups and invests in them with an individualized $90,000, 12-week program of mentorship, advice and exposure to experienced players in the startup world, including investors. Recent numbers show 71 gener8tor alumni have cumulatively raised more than $150 million in follow-on financing (additional funding to reach the next milestone). Businesses go to grow at gener8tor. The accelerator is working in Madison and Milwaukee, has recently expanded to Minnesota and just unveiled its “Project North” initiative, a three-year compilation of companies doing innovation strategy and venture capitalization. On top of that, gener8tor has partnered with Microsoft on TEALS, a program to help Wisconsin high schools offer Advanced Placement computer sciences classes. The startup accelerator is one of the organizations attracting national attention to Madison and its business scene. Stemina Biomarker Discovery’s roots are in stem cells, one of the pillars of Madison’s standing in the bioscience world. After eight years as general counsel and director of business development for the Wisconsin Alumni Research Foundation, or WARF, Beth Donley founded Stemina in 2006 with University of Wisconsin–Madison scientist and pioneer stem cell researcher Dr. Gabriela Cezar. Within three years Stemina’s first product hit the market and the company took off, growing its team and expanding its drug-screening technologies to diagnostic biomarker discoveries in autism, cancer and reproductive biology. Any conversation about Madison’s business scene today must include the incredible performance and potential of its health sciences sector. Stemina Biomarker Discovery, under Beth Donley’s leadership, is among the best of the bunch. Mike Victorson was thrilled when he learned Donley was one of his fellow Best of Madison Business honorees. Victorson is president and CEO of M3 Insurance. Donley is on M3’s board of directors. “She’s my boss,” says Victorson. So it goes in Madison business. M3 Insurance is one of those local legacy businesses with a traditional, old-school feel that is belied by its vision and culture of innovation. Victorson’s view of M3’s products and services is national in scope and bullish in perspective, which matches his thinking about Madison’s business community in general. Victorson is also passionate about another element he sees as fundamental to Madison business, and that’s community involvement. Board service, volunteerism, philanthropy and commitment to inclusion, diversity and equality are all hallmarks of M3, which Victorson models personally. He’s fluent in 21st century strategies for growth that are as sustainable as they are just, and his excitement about Madison’s future is infectious. The city’s future looks a lot like Sabrina Madison. So does its present, for that matter. Madison, better known as Heymiss Progress, is an organizer, a motivator and a connector. And she is indefatigable. She refers to herself as a “socialpreneur,” a description that also fits her Progress Center for Black Women, which opened Nov. 3 as a hybrid co-working, gathering, collaborating and incubator space that, true to its name, is focused primarily on black women looking to share and pursue their dreams. Madison is a powerful and inspirational speaker and the creator of the annual Black Women’s Leadership Conference, Black Excellence Youth Conference and Black Business Expo. Innovation exudes from everything she does. The late editor of Madison Magazine, Brian Howell, championed and celebrated that kind of creative passion, and thus Sabrina Madison is this year’s Brian Howell Excellence in Innovation Award winner. She is — along with Troy Vosseller, Joe Kirgues, Beth Donley and Mike Victorson — the Best of Madison Business.